Emily Grosholz discusses the craft of translation and her most recent collaboration with French poet Yves Bonnefoy: Début et fin de la neige / Beginning and End of the Snow. 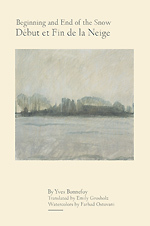 The book, published by Bucknell University Press in 2012, includes Bonnefoy’s original poems in French opposite Grosholz’s English translations as well as artwork by Farhad Ostovani. What first attracted you to Yves Bonnefoy’s poems? When I was in graduate school, studying philosophy at Yale University in the 1970s, I was introduced to the poetry of Yves Bonnefoy by a fellow student who lent me a copy of Du mouvement et de l’immobilité de Douve. I thought it was wonderful—haunting— and translated some of the poems in it, just for myself. Returning from a year in Germany in September 1977, I learned that Bonnefoy was teaching at Yale that semester, and so attended his lectures on Baudelaire and Hugo, those two great and utterly disparate poets, both of whom I’d tried my hand at translating earlier, in high school and college. 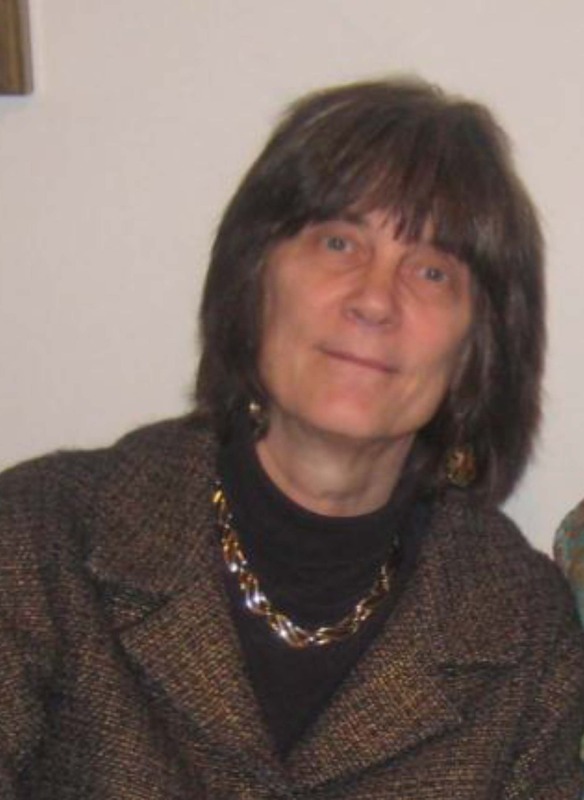 At the end of the semester, I gave Bonnefoy some of my translations of his work, and some of my own poems, in particular an elegy for my mother that I wrote in Germany, “Letter from Germany,” the first of my poems to be published in the Hudson Review. He was very appreciative, we struck up a correspondence, and I got to know him and Lucie Vines Bonnefoy a bit when I spent half a year in Paris in 1981. I have been translating his poetry ever since, somewhat haphazardly, choosing poems that I especially liked. Because his sensibility seemed close to my own while his poetic habits were very different, it was a challenging combination. How do you approach the task of translating another writer’s work? At first, I dealt with the affinity-and-distance by writing ‘versions,’ like Robert Lowell, allowing myself a great deal of freedom in departing from the original text. I like some of my translations from this earlier stage, especially “To the Voice of Kathleen Ferrier,” which is included in the forthcoming collection Poets Translate Poets: A Hudson Review Anthology, edited by Paula Deitz. But after collaborating with Larissa Volokhonsky on translations of poems by the Russian poet Olga Sedakova, I was persuaded that I should try harder to remain true to the original, its vocabulary and prosody. Thus I went about translating Début et fin de la neige in a different way, after Yves Bonnefoy asked me to translate this ‘American’ book of poetry, inspired in part by the time he spent teaching at Williams College. I consulted with the poet (and his American wife Lucie Bonnefoy) more often, going over every line, and listened more attentively to their advice. What is the connection between the artwork and the poems in Beginning and End of the Snow, and why did you and Yves Bonnefoy choose to include Farhad Ostovani’s watercolors in the book? Yves Bonnefoy is widely considered the greatest post-war French poet, and has worked with many important artists, including Giacometti, Tàpies, Cartier-Bresson, Ubac and Miró, as well as more recently Alechinsky, Palézieux and Ostovani. I think the explanation why he and Ostovani have collaborated on almost two dozen books and catalogues in the recent past is the excellence of the artist’s work and Bonnefoy’s accurate estimation of it. Farhad Ostovani was born in northern Iran and lives and works in Paris; his work has been exhibited at the Jenisch Museum (Switzerland), the Museum at the Rembrandt House (Netherlands), the Morat Institute for Art and Art Research (Germany) and the Chateau de Tours (France). Thus it was natural to ask if we could use some of his work for this book too. Are you working on any other projects in conjunction with Bonnefoy or Ostovani? Five years ago, I collaborated on a book with Farhad Ostovani, Feuilles / Leaves, with translations of my poems into French by Alain Madeleine-Perdrillat; it was published by William Blake & Co. in Bordeaux. I wrote an ‘ekphrastic’ poem about one of his works, which was published in American Arts Quarterly last year; and I recently published a review of one of his exhibitions as well as a poem dedicated to him (and Orhan Pamuk) in the Hudson Review. I plan to go on translating the poems of Yves Bonnefoy in my accustomed, haphazard, admiring way now that the book is finished.